One of those strange things you see sometimes. This picture was taken in Ely sometime in end September. 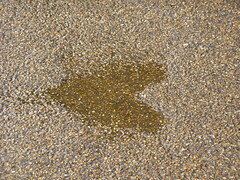 It was raining, and while walking, I spotted this heart-shaped puddle on the road. Funnily enough, this was visible from only one particular angle, and if we had walked in another direction, we would have missed this altogether. The puddle is about 8 inches across. Now to speculation.. how would such a shape form on the road ? Was it intentional or merely a matter of chance ?